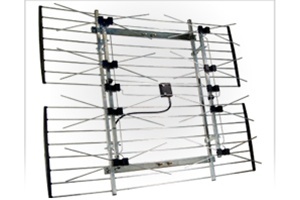 The Channel Master CM 4228HD is a 8-Bay UHF outdoor TV antenna which also picks up High VHF. This antenna has a High VHF signal range of 45 miles picking up available local channels 7 thru 13 and a UHF reception range of 60 miles picking up channels 14 thru 69. This antenna is optimal for receiving the highest quality UHF along with local VHF channels as well. With an HD television you will pick up any crystal clear HD signals being broadcasted in your area.